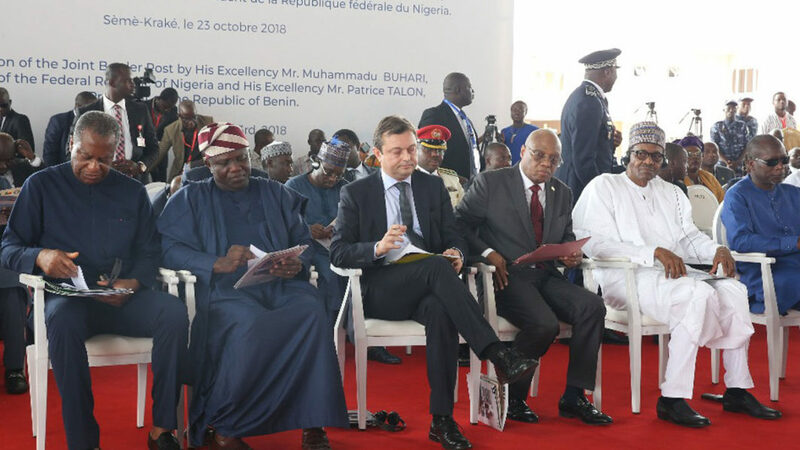 Republic of Benin President Patrice Talon (right); President Muhammadu Buhari; Chairman, Economic Community of West African States (ECOWAS) Commission, Mr. Jean-Claude Brou; European Union Representative, Amb. Oliver Nette; Lagos State Governor Akinwunmi Ambode and Minister of Foreign Affairs, Geoffrey Onyeama during the official handover of the ECOWAS Border Post at Seme-Krake in Badagy, Lagos …yesterday. President Muhammadu Buhari yesterday evaded the notorious Lagos-Badagry-Seme Road, flying instead on an aircraft to Seme for the official handover of the new Economic Community of West African States border posts in Badagry to his Republic of Benin counterpart, Patrice Talon. The News Agency of Nigeria (NAN) reports that Buhari, accompanied by Lagos State Governor Akinwunmi Ambode and other officials, touched down on a Nigerian Air Force helicopter around 11:25 a.m.The symbolism of his mode of transportation was, however, not lost on some residents who expressed disappointment at his alleged refusal to travel by road and experience their painful reality. The road, a major artery in West Africa’s largest economic hub, Lagos State, has been notorious for its decades of neglect by the Federal Government and half-hearted rehabilitations. It has also remained the subject of persistent complaints, accidents and deaths. Also, the Aholu of Kweme Kingdom, Badagry, Oba Sejiro Olalekan, said it would have been better appreciated had the president come by road to see what Badagry indigenes were passing through.“You cannot build this kind of gigantic building here and our roads will not be in order. Seme is the most lucrative border we have but the road leading to Badagry and Seme is bad. We spent more than four to five hours coming from Lagos to Badagry, which is supposed to be 45 minutes. We are pleading that our president would look into major roads leading to the gigantic building. This road is our major concern now,” he said. One importer, John Osanga, said despite the commissioning of the border post, trade inflow would face difficulties if the road remains in disrepair. Its deplorable state has contributed largely to the high cost of importation through the Seme border, he said. Lyor Johnson Akinbobola‏@JohnsonLyor said: “You still haven’t got what we are saying. There’s no road from Mile2 to the said border. FG needs to be more proactive. FG must rise to the task.” Buhari meanwhile pledged that Nigeria would work closely with the Republic of Benin to ensure the success of the border post.